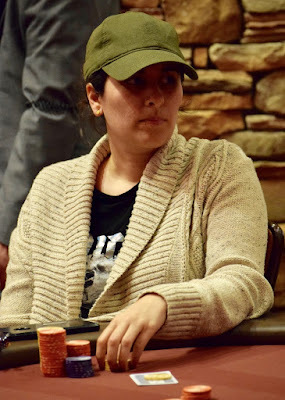 Kindah Sakkal was at 200,000 and had a share of the chiplead as today's @WSOP Circuit @Thunder_Valley Event 4 reached the money bubble. 17 hands on the bubble, Sakkal added 75,000 to her stack and maintained the chiplead as the bubble finally burst. Dermot Lyons picked up a full double during Bubble Play, moving to 235,000 and the 2nd stack. 18 players remain in $365 with a $25,000 Guarantee, all in the money, playing for a top prize of $12,958 and TVPokerRoom Circuit Ring No. 3 this year.